Not all of the early golf clubs flourished. Gone is Belfield Country Club, founded in Germantown in 1899. Albert W. Tillinghast, a member who would become one of America’s half-dozen greatest golf course architects, held the course record (twice around the 2,666-yards nine in 80) there in 1903. Gone, too, is Belfield’s neighbor. Mount Airy Country Club. But its successor club thrives today. And over the years since Whitemarsh Valley’s formation, in 1908, it has certainly witnessed more rounds by the finest players of the 20th century—ranging from Jock Hutchison, who in 1917 won the wartime substitute for the U.S. Open here, to Jack Nicklaus, three-time IVB champion—than any other course in the Philadelphia area. 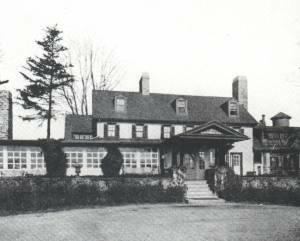 Whitemarsh Valley’s original clubhouse — about 1914. 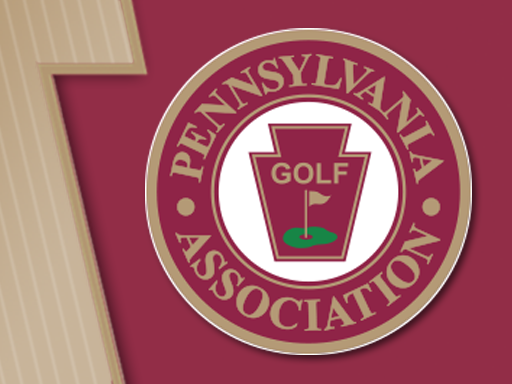 Whitemarsh Valley Country Club was incorporated in April, 1908, by a group of former members of Mount Airy, which was forced to disband when the club was unable to get a satisfactory extension of its lease. William Disston was elected president, S. Boyd Carrigan first vice president, Joseph A. Slattery secretary, and William F. Kling treasurer. The bulk of the club’s land—its present property—was bought from George C. Thomas, Jr., over the next three years. Thomas had made this estate, which his father gave him when he was 21 and which he called Bloomfield Farm, his home, and he would make it an outstanding golf course. After graduating from the University of Pennsylvania in 1894, George Thomas worked with his father in the banking firm of Drexel & Co. until 1907. His early avocation was gardening—in fact, he became a recognized authority on the breeding of roses, about which he wrote several books—and this led him into the landscaping aspects of golf course design. He laid out a nine-hole course in Marion, Massachusetts, in the early 1900s, and he gained valuable insight into the art of golf architecture by observing Donald Ross’s work on the original Sunnybrook course. He also consulted with Tillinghast on his design for the Cricket Club’s course at Flourtown, and welcomed the opportunity to observe what his friends Hugh Wilson and George Crump were up to at Merion and Pine Valley, respectively. The Whitemarsh course project, incorporating the Wissahickon Creek and embracing lovely rolling meadows that had once been the grazing land for some of America’s most famous thoroughbreds—among them, Leamington, Lexington, and Iroquois—and that had been his own home now for more than 15 years, was a natural one for Thomas. He made the most of it. In years to come his original design would be revised—more a matter of bunkering and green contouring than the basic routing of holes—first by William Flynn, then by Donald Ross. But the course we play today is, by and large, the work of George Clifford Thomas, who moved to California in 1919. Here he would become renowned as the designer of such outstanding courses as Bel-Air, Los Angeles Country Club’s North course, and Riviera. Here, too, he would write his classic Golf Architecture in America: Its Strategy and Construction. But his legacy to Philadelphia, the superlative eighteen at Whitemarsh (in 1952 Ben Hogan called it "one of the great golf courses")" is an enduring one.